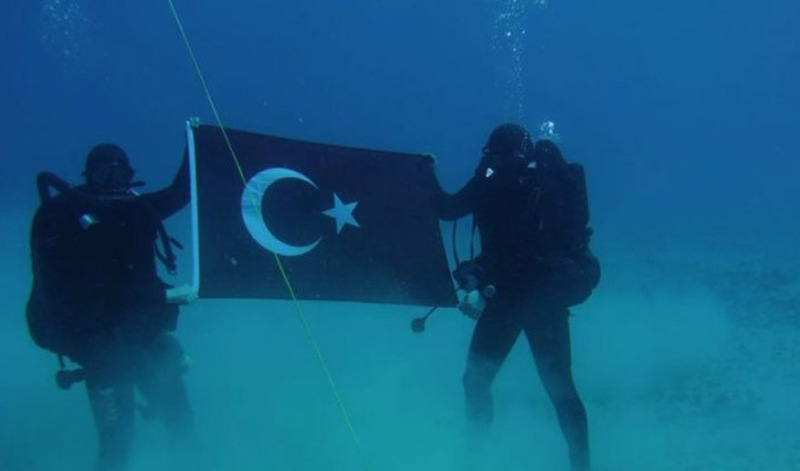 Turkish Navy divers provoke with Turkish flag in Crete with NATO’s backing! Turkey through Turkish Navy divers proceeded in one more provocation, but this time with NATO’s backing! The Turkish divers were photographed with the Turkish flag at the bottom of the Souda Bay NATO Naval Base in Crete and the NATO Maritime Command retweeted the picture in its official Twitter account. The NATO Maritime Command retweeted the picture from the Turkish Navy’s account! The Greek side already strongly protested with this evolving into a diplomatic incident being quite probable. Since then the post in question has been removed. NATO officers are investigating the issue trying to find out who was the person in the press office of the Command that made the provocative post. The Greek side ready to make a formal complain to the alliance. The fact that only the Turkish divers with their flag were posted on the account and it was not a joint move of all the participants that make up the NATO power SNMCMG-2 (Standing Nato Mine Countermeasures Group-2), gives this movement a clear provocative tone.